The Dyna is a soft-style bag with plenty of interior space and multiple exterior pockets. The zippered main storage compartment accommodates your personal items. Another zippered pocket in front, along with pockets on each end, securely holds cell phones, sunglasses and other often-needed items. Piped seams and nickel-plated solid brass hardware contribute to the purse's good looks and durability. 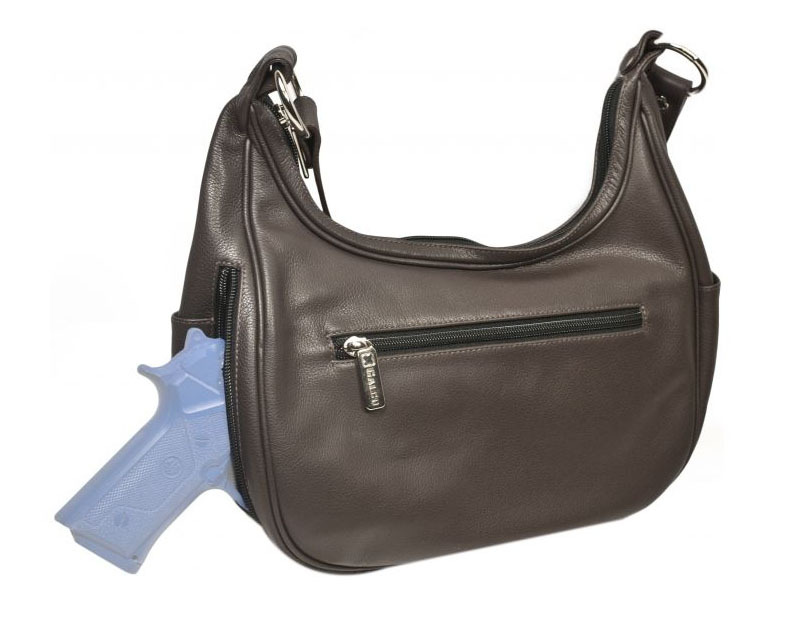 The Dyna's self-contained side-entry holster compartment accommodates most small and large-frame defensive handguns, and like all Galco handbags features a locking zipper for added security. Available in black or brown with nickel hardware. Dimensions are 7"H, 12"L, 5"W. Drop at shoulder: 18"
Colt 3 1/2" 1911, 3" 1911, 4 1/4" 1911, 5" 1911, 5" 1911 Rail Gun, Agent Revolver, Cobra, Detective Special 2", King Cobra 2 1/2", King Cobra 4", King Cobra 6", Mustang, Pony, Python 2 1/2", Python 4", Python 6", Trooper 4"